Join visionary artist Chris Dyer for a two-day workshop at Second Story Studios in Collingwood. A special opportunity to study with this positively creative soul. Chris will take students on a visionary journey, teaching painting techniques and as much as he can about a number of things! About the workshop: The workshop starts with a slideshow presentation of the short yet interesting history of skateboard art, to get you all stoked ‘n inspired. He will then explain his personal process of painting. His own art career started by recycling the old broken skate decks he was done riding and giving them new long-lasting life as wooden artworks. Chris will go step by step through the process of sketching the ideas, priming, drawing on the board, achieving quality graphic line work, painting, layering effects, colour theory, polishing and varnishing. Ideally we all end up with masterpieces at the end of the sessions, but either way you will learn much about how it’s done and have a blast jamming with Chris. After the initial two-days of learning and practicing, Chris will offer a 1-day Visionary Graffiti Workshop. In this optional session he will give a slideshow presentation about the history of graffiti and street art culture, his own points of view of where this movement is going and also teach about the technical side of the spray paint medium. He will spend most of the afternoon giving a demonstration, by spray painting a mural in Clifton Hill. All students will travel to the site to watch him in action. PLEASE NOTE: These sessions are during the daytime only. Meals and accommodation are not provided. There will be a short break to go for lunch near the venue. Or you can bring your own lunch or prepare your own food in the kitchen at Second Story. If art is more than a hobby for you, and you’d actually like to live off your passions, these presentations have all of Chris’s knowledge and secrets he’s accumulated over his 13-year career. 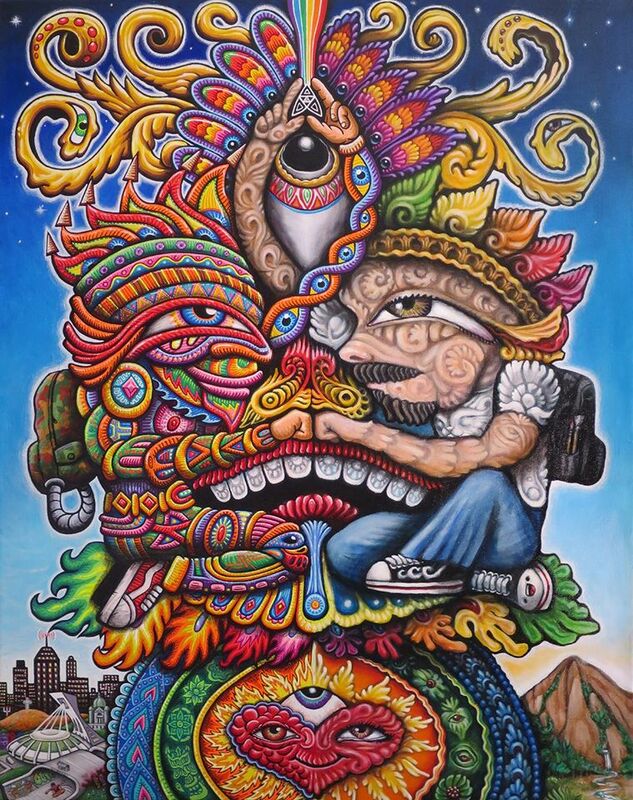 About Chris Dyer – a soul with high intentions for humanity and his self. He is a man on a quest for elevated consciousnesses through natural life experiences and introspections. A medium of the Great Spirit, who opens his vessel and tries to let go of the temporary complications of his ego-mind. A student of life and true soul skater, despite all the falls. Chris Dyer grew up in Lima, Peru till age 17, where he was involved in 80’s skateboarding, 90’s surfing and street gang activities. He eventually moved to Canada to study art for many years. Today he is based in Montreal, where he works out of his home studio “The Positive Portal” with his awesome artist girlfriend Arianne Cardoso. These days he also spends half of his time on the road, making and spreading his art worldwide, as he explores many cultures and himself. By now he has been able to reach over 30 different countries, which has been a chance for him to learn much from a variety of cultures. These powerful experiences has helped him create a flavour of art which fuses many cultures into a spiritual oneness of unity within diversity, which can appeal to all, yet is owned by none.